About Birdwatching Binoculars. Binocular basics. What about Birdwatching Binoculars and Why Use Them? Hummingbirds and many other birds are abundant all around us. For many, birdwatching is a kind of artistry. Hummingbirds and other birds are gorgeous. We want to see their beautiful colors and feathers close up and detailed. Sometimes it is convenient to remain at a distance enjoying hummingbirds. Observing their antics at feeders, at flowers or perched on a high branch is possible with binoculars. Through my binoculars, I like to watch hummers bathing in dew or a birdbath, hawking for insects (a spectacle in itself), and in the forest. 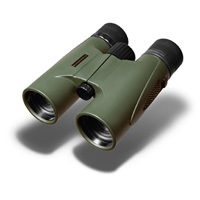 We understand about birdwatching binoculars and their purpose is to bring things close. Binoculars are simply two telescopes mounted side by side. Prisms inside bend the light back and forth to give the effect of a long telescope squeezed into a short tube. I am not technical in any way shape or form. So this simple definition helped me to relax about binoculars in general. What kind should I buy for birdwatching? What is my price range? In general quality goes up with price. How will I use them? For example, will I view birds in my backyard or use them for field bird watching? Magnification - 7x or 8x is good. A magnification that is too high might give less depth of field. Also, the stronger the magnification the more the binoculars are prone to shake. In other words, with a high magnification, it is harder to hold them steady to prevent focus shaking. Larger magnifications are best suited to use with a tripod. Lens Diameter - lens diameter should be at least 25mm. We need a clear image and a FOV (field of view) at least 300 ft. @ 1000 yds. A larger diameter lens will let in more light which is beneficial in low light situations. Weight - lightweight are easier to hold for long periods of time. Heavier binoculars are often easier to hold steady but not for long periods of time. Size - compact binoculars are easier to carry but have a smaller exit pupil. This is only important in low light conditions such as in a forest. Waterproofing - important for those who plan to view birds in all weather conditions. Most quality binoculars are at least water-resistant but the best are actually waterproof. I hope this clears up any questions you have about birdwatching binoculars and what to look for when considering a purchase.